After a couple of false starts we have bought this William Day (1764 -1807) watercolour of Cromford. The view is particularly interesting as it shows the view from the bridge with the smelting mills on the left hand side. This is an unusual and rare view as the mills were soon to be demolished to make way for the building of St Mary’s Church – Arkwright’s private chapel. 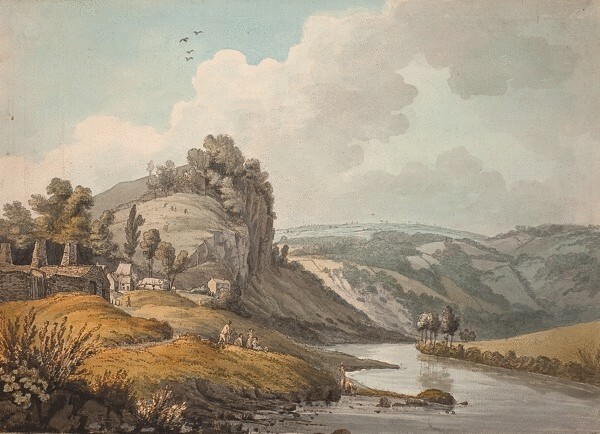 We know the watercolour was painted in 1789 while William Day was on a tour of Derbyshire. Day was a geologist and self-taught artist who showed work regularly at the Royal Academy as an ‘Honorary Exhibitor’ between 1783 and 1801. He visited the County with his friend and fellow artist John Webber (1751-1793), who was the official artist for Captain Cook’s third voyage. This purchase adds to the ‘pair’ of Webber and Day watercolours of Castleton that Buxton Museum and Art Gallery bought in 2011.